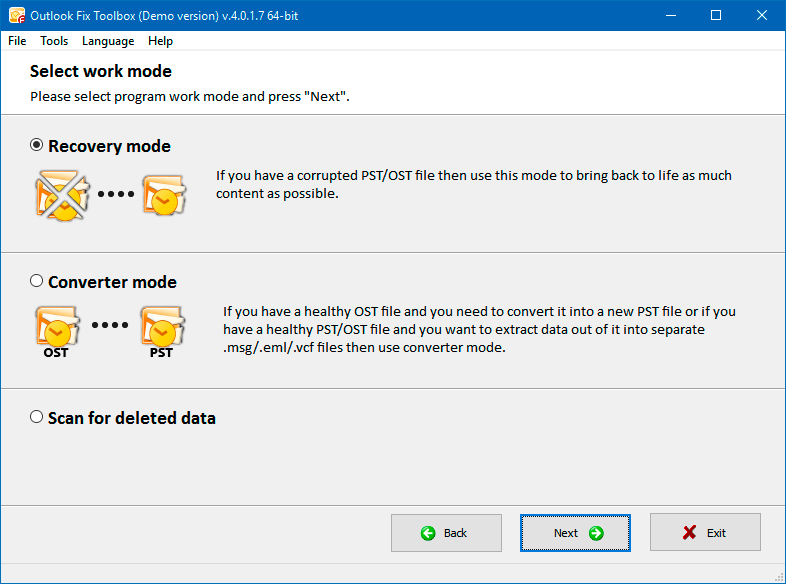 Outlook Fix Toolbox is a quick and effective tool for recovering information from damaged Microsoft Outlook *.pst and *.ost files. Fix damaged *.pst files in ASCII Microsoft Outlook 97 to XP format. Fix damaged *.pst files in UNICODE Microsoft Outlook 2003 and higher format. Fix damaged *.ost files of all versions. Read and recover encrypted and password-protected *.ost and *.pst files. Convert *.ost to *.pst, *.ost to *.msg, and *ost to *.eml. Convert *.pst to *.msg and *.pst to *.eml. Works with files larger than 2GB. Save data to separate PST/EML/MSG/VCF/TXT files. Fix mail in different formats plain text, RTF, HTML. Fix attached files and objects. Fix contacts, notes, notifications, calendar, meetings, and other data. 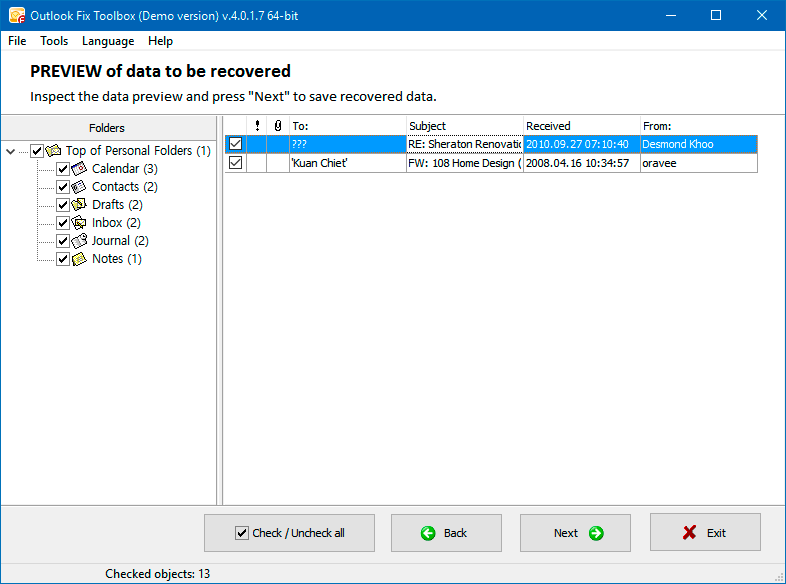 Save recovered folders and objects selectively. Fix errors caused by faulty operations by scanpst.exe and scanost.exe. Fix folder structure and type. Support for drag and drop. Support for 32-bit and 64-bit versions of Microsoft Outlook. The Microsoft Outlook pst fix tool can recover messages, contacts, reminders, meetings, tasks, notes, calendar, logs, and other data. It also allows you to convert *.ost and *.pst files. Software can fix Outlook data selectively. Note: The program is not licensed under GNU General Public License (GPL) or GNU Lesser General Public License (LGPL). Outlook Fix Toolbox is not open source software or a freeware tool. 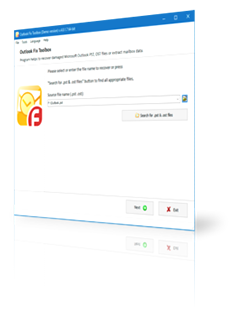 Outlook Fix Toolbox is distributed on the try-before-you-buy basis with a free DEMO version. 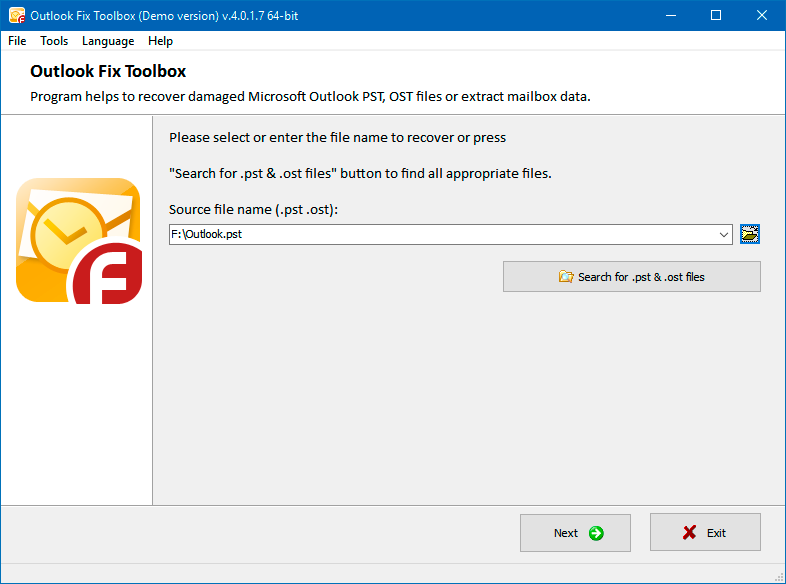 Requirements: of the Outlook Fix PST file tool: Microsoft Outlook installed (not obligatory). Note: Outlook Fix Toolbox does not support exporting groups of contacts. Selecting the pst file data from which should be recovered. Reading (detecting and recovering) data from the selected *.pst file. 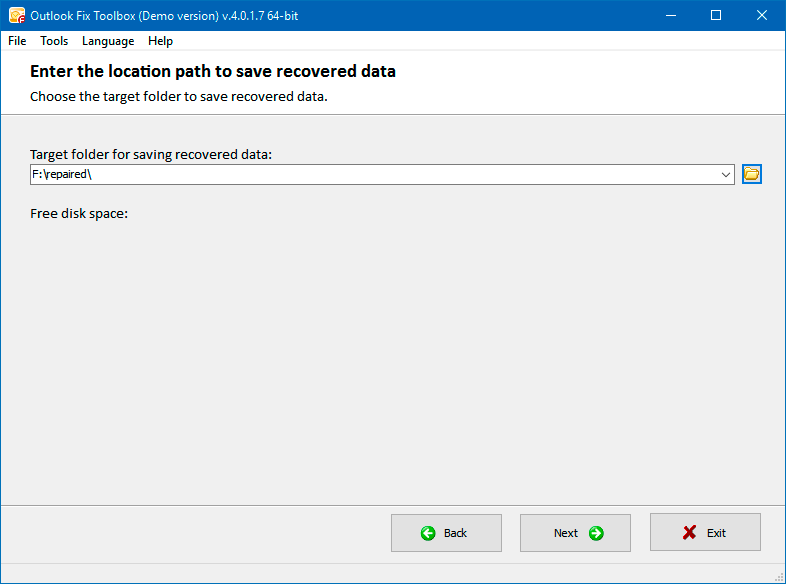 Selecting the location to save the recovered Microsoft Outlook data to. 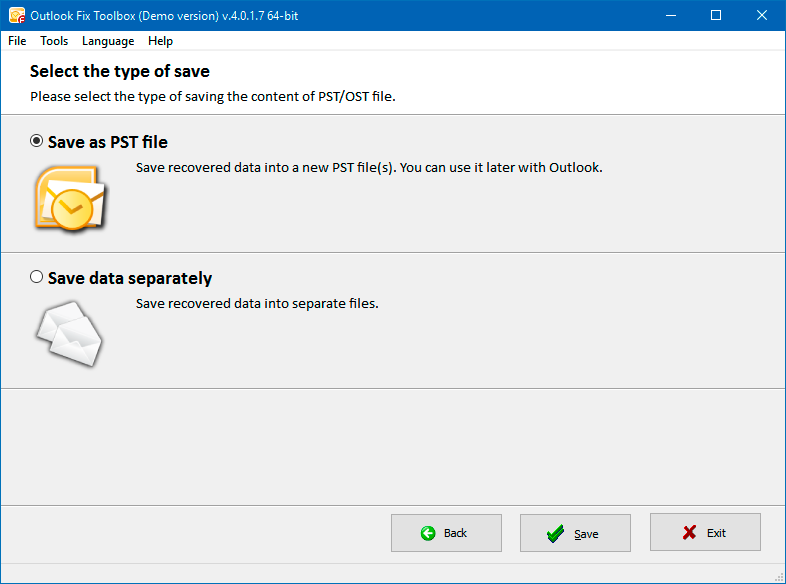 Selecting the method for saving the recovered Microsoft Outlook data.